Book now! Rates start at $3899 per person with a double occupancy including round trip airfare from either Tulsa or OKC. 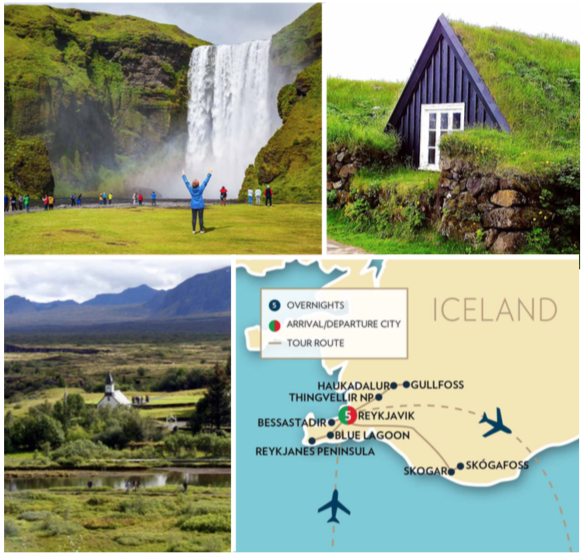 Today board your overnight flight to Iceland. Get ready to discover this small island nation featuring a landscape of interesting contrasts created by volcanoes & glaciers. The country is very progressive and makes great efforts to honor its Viking heritage. Arrive in Reykjavik, Iceland and meet your Tour Director. Reykjavík, Iceland’s capital, was founded in 1786 and is the largest and most populated city in Iceland. Enjoy a panoramic Reykjavik City Tour and visit Iceland’s National Museum. The Museum’s permanent exhibition entitled The Making of a Nation, allows you to walk through Iceland’s timeline from settlement to present day. Later transfer to your hotel and enjoy time at leisure. This evening enjoy a Welcome Dinner with your fellow travelers. Today depart on a full day Golden Circle Tour which is the name given to a 190 mile circular route which encompasses many of Iceland’s most famous landmarks. The three primary stops on the route are Thingvellir National Park, Gullfoss (meaning “golden falls”), and the geothermally active valley of Haukadalur, contain- ing the Strokkur Geyser, which erupts every few minutes spouting water 100 feet into the air. Enjoy a short walk to the Strokkur Geyser area with a local & taste freshly baked ‘Hot Spring Bread’ cooked using the heat from the geothermal activity. Later return to Reykjavik. Today enjoy a full day at leisure in Reykjavik to explore on your own. An optional whale watching tour will be available. Departing from Reykjavik’s Old Harbor, join experienced guides for an excit- ing adventure. The guides work together with the passengers on spotting the whales, making the trip an exciting and unforgettable experience. Enjoy the evening at leisure in Reykjavik. After breakfast, depart on a full day South Coast Tour including a visit to the Skogar Folk Museum. Opened in 1949, this unique outdoor attraction is a collection of houses close to each other. With a popu- lation of roughly 25, this town was highly affected by the eruption of the Eyjafjalla Volcano in 2010. The area is known for its waterfall, Skógafoss, on the Skógá river. The Skógafoss is one of the biggest waterfalls in the country with a width of 82 feet and a drop of 200 ft. Due to the amount of spray the waterfall consistently produces, a single or double rainbow is normally visible. This morning depart for the picturesque Reykjanes Peninsula. Stop in Bessastadir, an ancient site and home to Iceland’s President. Then enjoy a visit to the Viking Ship Museum in Keflavik. Explore five original Viking ships from the 11th-century, as well as “The Glendalough Sea Stallion”, a reconstruction of a war ship from the Viking age. Later see Lake Kleifarvatn known for its hot springs and mud pots. Next, travel to one of Iceland’s most well known and visited attractions, the Blue Lagoon. The geothermal pool sits in the center of a large lava field. Enjoy time to relax and take a swim in the warm waters rich in minerals. Later return to Reykjavik for a Farewell Dinner with your fellow travelers. This morning transfer to the airport with wonderful memories of your Iceland Adventure.